Disclosure: I'm excited to share this sponsored post with my readers. Monetary compensation has been received for this post. All opinions are my own. 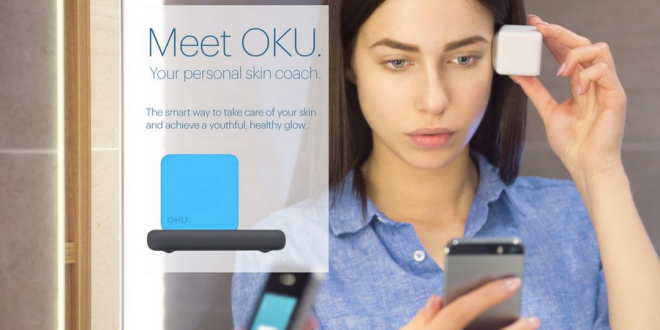 I am so excited to let you know that I am working with mySkin on the launch of the first ever iPhone-connected skin wellness scanning device, OKU by mySkin. It's super cool and ground breaking for the beauty industry, I can't wait to try it out! So a little about OKU - you can think of OKU as your own personal skin care specialist, available 24/7 via your iPhone! Going beyond photo analysis, OKU takes a trans-dermal image which looks a few mm below the skin's surface and analyze features such as moisture, oiliness, texture, wrinkles and pigmentation. Through intensive research by the mySkin team, the custom anti-aging app analyzes your skin and gives a detailed assessment of the skin in an easy to understand measurement called a skin score. Through this cute shaped device, all this data will allow OKU to give advice on your lifestyle and diet and will eventually (which is a sneak peak of future plans) recommend the right products for your skin, or the right routine to improve your skin wellness. You can pre-order OKU but it will not officially launch until August 2015 and it will have a retail of $299. In the meantime, you do not want to miss out on OKU's current Mirror Mirror contest! All you have to do to enter is go to their website to upload your thoughts and a photo on how you stay youthful (I.e. 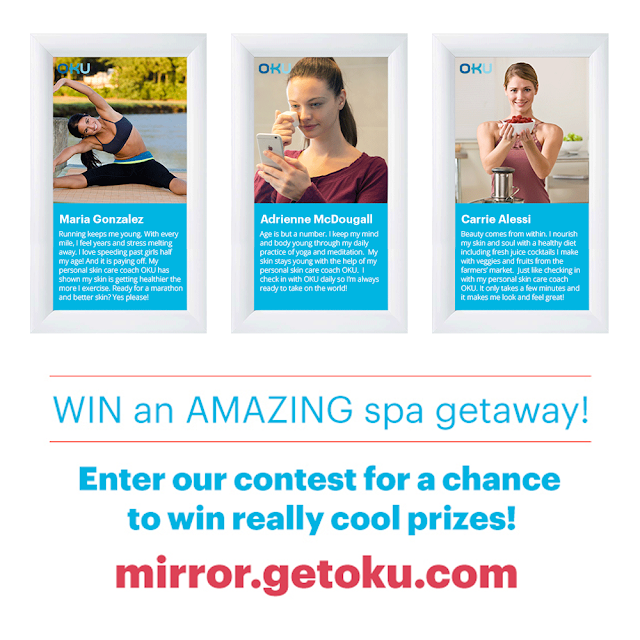 It could be as simple as running, walking, playing with your kids or anything else fun and crazy), for a chance to win an amazing SPA and Hotel visit in Miami Beach and other great prizes such as a $100 Sephora gift card. Head on over now to enter to win! Good luck!